Now the cat's out of the bag and you know when and where I'm going to be on TV, I'm excited to post a recipe I've been hanging on to for a while. This ratatouille recipe has a funny story behind it (but it's also very tasty, so I hope you make it!). I've seen the movie a million times, but I'd never actually eaten Rataouille before until Darren and I had it at our local bistro. We were obsessed, went home and trialled loads of recipes and landed on this one by Jamie Oliver. With a few tweaks - minus some vegetables here, add some butter there - we ate it all summer long in 2013. I had completely forgotten about it, until I ended up having to recall the recipe for the second round of Humble Pie auditions. Let's start from the beginning shall we? (If you're not bothered by my adventures in TV but you want to make this recipe, scroll down to the end of the post). One day back in April, I randomly saw a tweet about a new cooking competition looking for contestants; I was intrigued, so I replied to the tweet, filled out a form and then forgot about it. A few days later one of the production assistants gave me a call and we chatted about why I love cooking (because I love to eat), what my signature dish is (lemon drizzle), what my must-have kitchen essentials are (a v. sharp knife), etc. and they invited me for an audition a few days later. I'm a big believer in fate and I took the fact that the auditions were going to be on Good Friday - meaning I had the day off from work - as a sign. The only problem was I had to bring a dish with me and I only had 2 days to think of something. I tested a recipe that night that was a total fail so in a blind panic I turned to my faithful lemon drizzle and went to the audition. There were a few other people waiting nervously in a test kitchen as we chatted and eyed up each other's dishes. Mine was a disaster, as the accompaniments I'd made for the cake melted by the time I got there, and there was a guy who had brought a whole roast chicken, which he then proceeded to joint and serve, so you can imagine how nervous I was! Two weeks later I was invited to another audition, which is where the ratatouille comes in. This time, the audition was on my birthday! Again, I had the day booked off from work...fate! And it was taking place near my parents' house, so my mum could pick me up afterwards and take me for a birthday tea. Really, everything worked out perfectly. For this audition, we had to cook...on camera! They told us that week we'd be making ratatouille with a pan-fried chicken breast, but I didn't have time to practice so I just re-read the recipe I'd jotted down two summers ago and hoped for the best. I smoked out the whole kitchen trying to fry my chicken breast on an electric hob (! ), but the ratatouille itself was a success. Jamie Oliver's recipes are always straightforward, but have an extra-dimension that lifts everything and makes them seem much more complicated than they are; in this case, it's the salsa verde. Thanks Jamie! Luckily, my ratatouille turned out beautifully and another week after I found out I'd got through to be on the show. Throughout the whole process I was equal parts excited and mortified, sort of hoping that I wouldn't get through and actually end up being on TV! I'm glad I did it in the end, but I was a nervous wreck the whole of April and May...and I still am now waiting to see myself on the actual television! My episode of Humble Pie is scheduled for Friday 4th December and I can't wait to share the recipes I cooked on it.Yikes! For now, I hope you enjoyed this little story about how I came to be on a TV show...and please make this recipe because it really is a good'un. Roughly chop the onions and fry with butter in a large saucepan until soft and brown. Add 3 of the garlic cloves (chopped) and the dried herbs. Chop one of the courgette into rounds and add to the pan, along with the tomatoes, quartered. Let everything fry off for a few minutes and then add the chopped tomatoes. Add a little water if it looks too dry. Bring to the boil with a pinch of salt and pepper and then simmer with the lid on for about 20 minutes, checking every now and then to check the liquid hasn't boiled away. 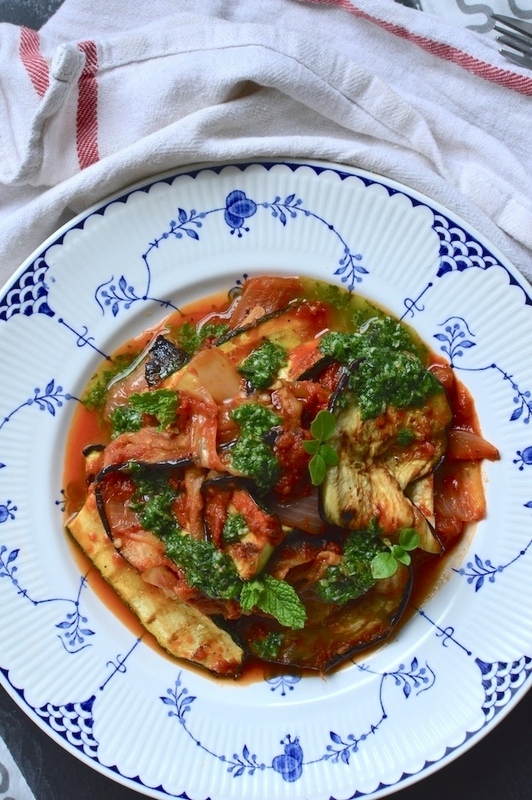 While the vegetables cook away, finely slice the remaining courgette and the aubergine lengthways, brush with olive oil and place under the grill, turning occasionally until browned. Add to the pan with the stewing vegetables and turn off the heat. Using a small food processor, whizz up the basil, mint and the remaining garlic clove with the juice of half a lemon and a few glugs of olive oil. You want a loose sort of pesto. 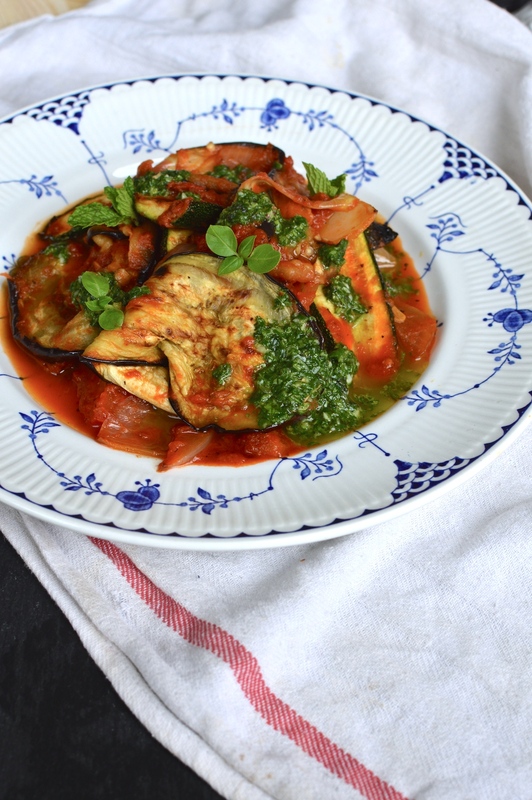 Serve the ratatouille in a shallow dish with the sauce drizzled over the top and some torn mozzarella - it's not traditional, but it's delicious and adds a bit of protein to make a more hearty meal. This does look yum! I've never made ratatouille either. Can't wait t see the show!